Welcome to my weekly $50 Target WOW Gift Card Weekend Giveaway! 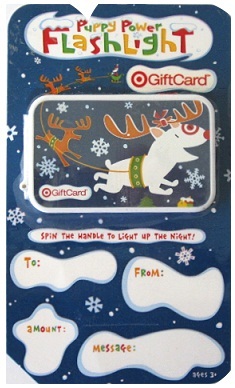 Every week I load $50 onto an extra fun Target Gift Card & Give it away to one lucky reader. These special cards all have some kind of fun twist to them and are now retired and can no longer be purchased in store or on Target.com. This week’s super-cute “Puppy Power Flashlight” features Bullseye the Dog as Rudolph! He looks so adorable with his red nose and antlers, and you simply spin the handle to make it a working flashlight. Not only is it entertaining, but sure to bring some holiday happiness since it will come pre-loaded with $50 for the winner to spend on whatever they want at Target! This Giveaway will end on Sunday 11/25 at 11:59 pm EST, and I will pick one winner by random when it ends. I hope you enjoy these weekly Wow Target Gift Card Giveaways and check back every weekend to see a new one and get another chance to win! Good Luck everyone! What a cute giftcard- thanks for the giveaways! Yay for Target gift cards! I truly enjoy your site. Thanks for the weekly drawings! I subscribe to totally taget emails. Thanks for the great site!! Such a cute card! Hope to win! I like you on FB! Thanks for the givaways! follow on fb and twitter! Would love a mini shopping spree at Target…thanks for the chance! Thankyou for your site. You make shopping easier. Target is a great store. i liked on facebook and subscribed via email!!! Love your page! Great giveaway! Subscribe via email and follow on fb. This would help with the Christmas shopping! Happy Thanksgiving! Love to win. Still have lots of Christmas shopping to do, so this would help! Love the giftcard – ooooo I could use this for xmas gifts! Thanks for the chance, I love Totally Target!